Nowadays, there exist different fields of Robotic technology. One of them is Nanorobotics. It is a field of robotics where groups of robotics and biotech engineers are developing complex robots of very small size. The nature of the components being in the nano scale, allows the researchers to mimic human behaviour. The construction of the various complex parts, which constitute the robots, have been possible due to nanorobotics. Several engineers, scientists and doctors believe that nanorobotics applications are practically unlimited. Breaking up blood clots: Blood clots can cause complications ranging from muscle death to a stroke. 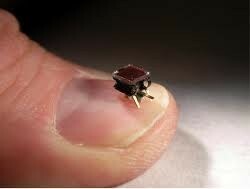 Nanorobots (also called nanobots) could travel to a clot and break it up. This application is one of the most complex and sophisticated uses for nanorobots. The robot must be able to remove the blockage without losing small pieces in the bloodstream, which could by chance travel somewhere else in the body and cause more problems. The robot must also be small enough so that it doesn’t block the flow of blood itself. Fighting cancer: Doctors hope to use nanorobots to treat cancer patients. The robots could either attack tumors directly using lasers, microwaves or ultrasonic signals or they could be part of a chemotherapy treatment, delivering medication directly to the cancer site. Doctors believe that by delivering small but precise doses of medication to the patient, side effects will be minimized without a loss in the medication’s effectiveness. Helping the body clot: One particular kind of nanorobot is the clottocyte, or artificial platelet. The clottocyte carries a small mesh net that dissolves into a sticky membrane upon contact with blood plasma. According to Robert A. Freitas, Jr., the man who designed the clottocyte, clotting could be up to 1,000 times faster than the body’s natural clotting mechanism. Doctors can use clottocytes to treat hemophiliacs or patients with serious open wounds. Parasite Removal: Nanorobots could wage micro-war on bacteria and small parasitic organisms inside a patient. 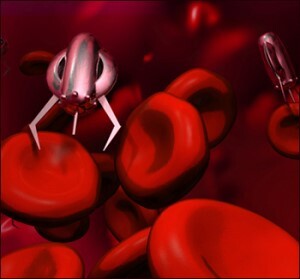 It might take several nanorobots working together to destroy all the parasites. Gout: Gout is a condition where the kidneys lose the ability to remove waste from the breakdown from the bloodstream. This waste sometimes crystallizes at points near joints like the knees and ankles. People who suffer from gout experience intense pain at these joints. A nanorobot could break up the crystalline structures at the joints, providing relief from the symptoms, though it wouldn’t be able to reverse the condition permanently. Breaking up kidney stones: Kidney stones can be intensely painful — the larger the stone the more difficult it is to pass. 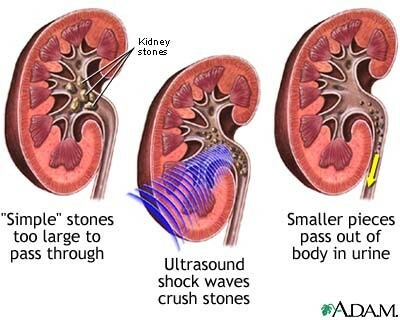 Doctors break up large kidney stones using ultrasonic frequencies, but it’s not always effective. A nanorobot could break up a kidney stones using a small laser. Cleaning wounds: Nanorobots could help remove debris from wounds, decreasing the likelihood of infection. They would be particularly useful in cases of puncture wounds, where it might be difficult to treat using more conventional methods. i. Transmigration of the white blood cells (WBC) and other inflammatory cells to the inflamed tissues by attaching to them for accelerating the healing process. ii. 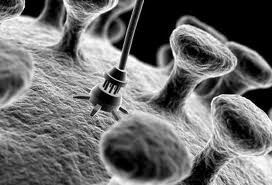 Drug delivery nanorobots, known as ‘pharmacytes’, will be applied in future therapeutics against HIV. iii. Nanorobots can help in the control and monitoring of glucose levels in diabetic patients. iv. Special kinds of nanorobots can be applied in the therapeutics for atherosclerosis. 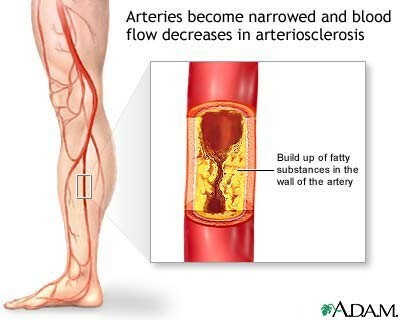 The atherosclerotic plaques are localized mainly in the coronary arteries. The medical nanorobots may help in locating the atherosclerotic lesions in the stenosed blood vessels and help in their mechanical, chemical, or pharmacological treatment. v. Nanodentistry is one of the unique applications, whereby nanorobots help in different processes involved in dentistry. They can help in inducing oral anaesthesia, desensitization of teeth, manipulation of the tissue for the re-alignment and straightening of the irregular set of teeth and for the improvement of the teeth durability, major tooth repair, generation of nanofillers, improvement of teeth appearance, etc. vi. Nanomedical devices can help in surgery by using surgical nanorobots for nanomanipulation in the target site with programming and guidance from a surgeon. vii. Nanomedicine can find application in cryostasis, i.e. reversal of freezing injury by introduction of cryoprotectants and other chemicals into the vascular system rapidly, using nanorobots. viii. Medical nanorobots can help in the diagnosis and testing of different diseases and help in their monitoring by recording different biological variables such as temperature, pressure, activity of the immune system, etc. very rapidly at the target site after oral introduction of nanorobots. ix. Medical nanomachines can help in gene therapy for different genetic diseases by introducing different modifications and corrections via editing in the right place the DNA or the proteins attached to the DNA. Now let’s take a practical approach to Nanobots! Self-directed assembly as seen in the self-assembled monolayers, self-assembled lipidic micelles and vesicles, which follow the Brownian theory of self-assembly. DNA-directed assembly using part of DNA for assembling, which works on the self-assembly principle of complementary base pairing and has application in the DNA based rotary motors. Protein-directed assembly as is seen in genetically engineered chaperon proteins that help in the assembly of gold nanoparticles and semiconductor quantum dots into arrays in the Nano scale range. Ratchet action protein based molecular motors have also found much application in biology. Microbes and virus directed assembly, which includes various bacteria that are incorporated into microelectromechanical systems (MEMS) and help in acting as living motors, pumps, etc. Viral capsid shells have also found application in acting as scaffolds for the assembly of the nanoparticles such as quantum dots. We need to find a way of introducing the nanomachines into the body, and allow them to access the operations site without causing too much ancillary damage. We have already made the decision to gain access via the circulatory system, which leaves us with a number of considerations.. The first is that the size of the nanomachine determines the minimum size of the blood vessel that it can traverse. Not only do we want to avoid damaging the walls of whatever blood vessel the device is in, we also do not want to block it too much, which would either cause a clot to form, or just slow or stop the blood flow, precipitating the problem we want to cure in the first place. What this means, of course, is that the smaller the nanomachine the better. However, this must be balanced against the fact that the larger the nanomachine the more versatile and effective it can be. This is especially important in light of the fact that external control problems become much more difficult if we are trying to use multiple machines, even if they don’t get in each other’s way.. The second consideration is an even simpler one: we have to get it into the body without being too destructive in the first place. This requires that we gain access to a large diameter artery that can be traversed easily to gain access to most areas of the body in minimal time. The obvious candidate is the femoral artery in the leg. This is in fact the normal access point to the circulatory system for operations that require access to the bloodstream for catheters, dye injections, etc., so it will suit our purposes nicely.. The very first Feynman prize in Nanotechnology was awarded to William McLellan for building an electric motor that fit within a cube 1/64th of an inch on a side. This is probably smaller, and would need the help of a propeller. Other Devices which can be used for injecting nanobots are: Electromagnetic pump, Jet pump, Membrane propulsion, Crawl along surface. Tracking and controlling nanobots include such means as: Ultrasound, MMR/MRI, Radioactive dye, x-rays, using special chemicals, spectroscope, TV cameras. Nanobots are going to play a very important role in the future in the medical field. They can even start a revolution in medicine. However, there are some disadvantages which accompany the use of nanorobots. The complexity of the design and manufacture, accompanied by high cost, is a major drawback for the wide application of nanorobots. The other disadvantages are the possible anti-social applications that accompany every new discovery in science. In spite of the drawbacks, the application of molecular nanotechnology may help in the development of therapeutics for different fatal diseases in the future, thus creating a revolution in healthcare and prolongation of life.